In a carefully calculated marketing ploy to inspire rich buyers to buy their cars and find a way to donate just enough money to charity in order to eliminate their unjust tax burden, BMW has created the perfect storm of buzz words to inspire people to buy. 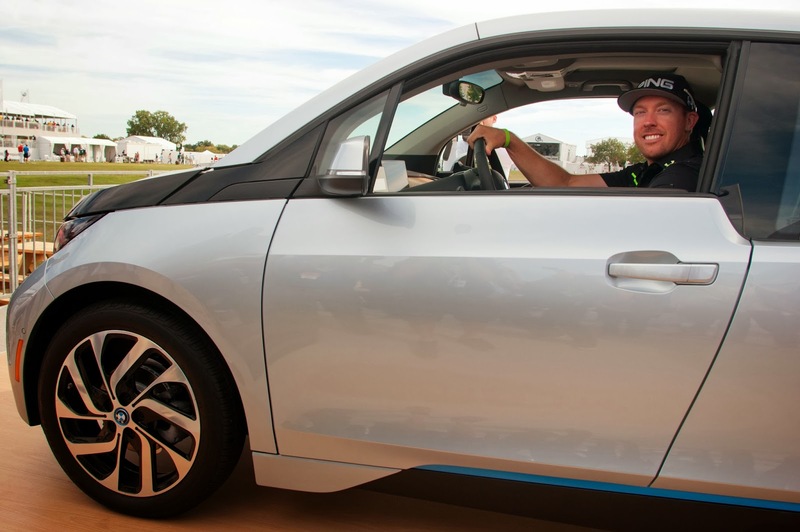 The2013 BMW Championship kicked off on Tuesday, September 10 when PGA golfer and defending champion Rory Mcllroy competed in a driving challenge with Gary Woodland in a BMW i3, the first purpose built electric vehicle made primarily of carbon fiber. 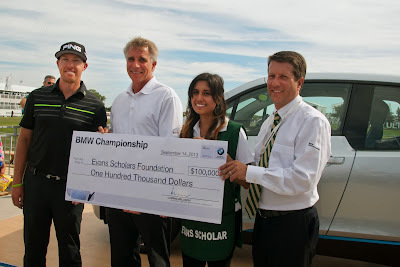 McIlroy and Woodland competed on a specially created driving course at Six Flags Great America for the BMW Championship and Evans Scholars Foundation, to which BMW made a $10,000 donation in their honor. They completed several laps in the i3 on the course, and were only two seconds shy of beating the track record. Both golfers were two of the first people in the world to drive the i3 since the car’s global reveal on July 29. The i3 will launch in the US in spring 2014. They were joined at the finish line by Evans Scholars Justin Cruz and Yesenia Juarez who are both students at Northwestern University. Can you feel it? Can you smell it? That smells of success and Evian, mixed carefully by a cute assistant right out of college looking to earn a few extra credits while working for free. They're using charity for aspiring college grads (because screw you if you don't get a degree) to market their all-new electric car. And considering that the average annual income of a Chevy Volt buyer is $175,000 why the heck not? It's about time BMW stopped losing customers to an American economy car. How embarrassing for the Germans considering how well known they are for making quality cars with solid electrics... Especially when you factor in the fact that the BMW i3 will be the perfect price to compete in that market. The i3 will be priced starting at $41,350 and looks to shake up the Volt market share. Continuing the BMW Championship tradition, there will be many incentives for those who score a hole-in-one at this year’s tournament. EVANS SCHOLARSHIP: BMW will provide a full four-year Evans Scholarship worth $100,000 in the name of the first player to score a hole-in-one on any hole during the tournament. BMW i3: The first player to hit a hole-in-one on the 17th hole will receive a new BMW i3, the first purpose-built electric vehicle to be made primarily of carbon fiber from the ground up. 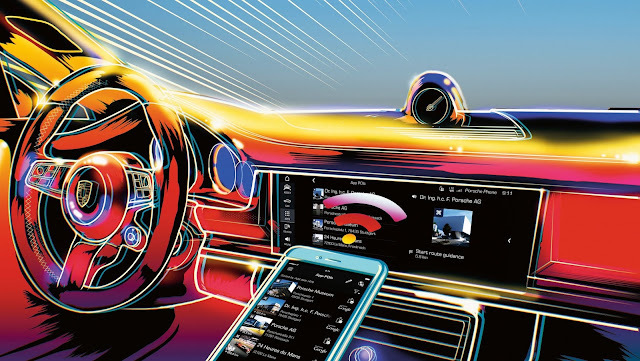 BMW i is BMW’s sustainable brand with a mission to develop visionary vehicles and services that revolutionize individual mobility. BMW M6 GRAN COUPE: The first player who achieves a hole-in-one on the 11th Hole will receive a new, a new 4-door addition to the M Series line that successfully combines high performance, outstanding technology and the sensation of motor sports with interior room and amenities for up to five passengers. 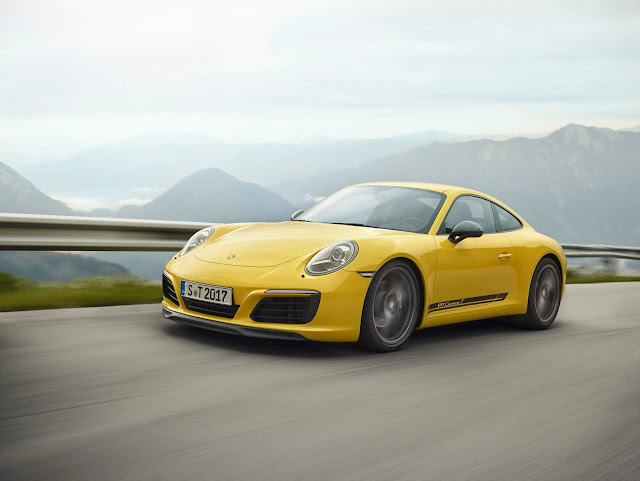 It features aTwinPower Turbo V-8 engine and accelerates from 0-60 in 4.2 seconds. Mmmmmm, marketing. I can hear my accountant itching to add more write-offs for my 2013 filing. I knew there was a reason I pay them so much. Keep Uncle Sam out of my pocket! What's the most ridiculous marketing or press release on the web you've come across? Best comments will get featured next time I write: Ridiculous Press Releases.